Le Cigare Blanc is the white version of Bonny Doon Vineyard’s masterful homage to Châteuaneuf-du-Pape, Le Cigare Volant. For the uninitiated, that red wine is named to honor a decree issued in a village in that famous wine region which banned flying saucers from ever landing there and ruining the vineyards. The region has never encountered the need for enforcement of that decree. The light-hearted aspect of the name sits at the crux of Bonny Doon winemaker/owner Randall Grahm's sense of humor, a sensibility that permeates his writing and his labels. As "president-for-life" of Bonny Doon, it is his wit that marks the wines and the marketing effort behind them. This blend of 62% Grenache Blanc and 38% Roussanne is Grahm’s tip of the hat to the white blends of Châteauneuf-du-Pape. He e explains on the label, “Resistance is futile,” and he is correct. biodynamically farmed. 2011 was a particularly cool vintage, so the wine offers great flavor at a modest alcohol level of 12.5% abv. 1,650 cases were produced and they all are contained under what Grahm knows as a Stelvin closure. You may know it as a screwcap. The wine underwent a complete malolactic fermentation, so the mouthfeel is full and rich. Aging took place in French oak barrels, and the suggested retail price is $28. Le Cigare Blanc has a golden tint and a nose of apricots and cantaloupes, with a nutty little backbeat. A quince flavor leads the way on the palate, with a savory quality - an almost salty quality - that intrigues me greatly. Despite the intensity of the fruit here, it is the salinity that stays with me as a reminder. The acidity is razor sharp and ready for whatever food you'd like to have with a white wine. This wine's complexity is - to me, anyway - literally dazzling. As much as I admire Grahm's red wines, Le Cigare Blanc may well be my favorite of the Bonny Doon line. The Réserve version of Le Cigare Blanc is labeled as en bonbonne, meaning the wine is aged in a carboy - a big glass jug. Grahm feels this type of aging allows the wine to retain its freshness over a number of years. The 2010 vintage is the second for this version of the wine. The fruit again comes from Beeswax Vineyard, while the mix is 56% Grenache Blanc and 44% Roussanne. Easy on the alcohol again, too, with 12.4% abv. Bonny Doon produced only 498 cases, and the screwcap closure is used, as in all of Grahm's bottlings. He says you can tuck this one away until 2020 without a worry. According to Grahm, it tastes younger every time he samples it. The unfiltered wine may appear partly cloudy in your glass - it did in mine. It is sold only to DEWN club members at a retail price of $50. It is highly interesting how two wines of such a similar nature can be so different. Clearly, the aging process tells the story of these fraternal twins. The Réserve - aged in glass - shows a very different bouquet than its wood-aged counterpart. Strong floral scents mingle with orange peel and a bit of almond on the nose, while the palate is youthful and breezy, with plenty of citrus. The two wines do share certain qualities, though. The bracing acidity and the savory taste are here, with that lovely salinity lasting long into the finish. Winemaking is a tough enough profession, but a winemaker who can make world-class puns at the drop of a hat while doing the Sunday New York Times crossword and microblogging on Twitter is a man to be admired. Besides the Rhône-varietal wines Randall Grahm is known for, he also likes to dabble in some other grape nationalities, too. He has done some interesting things with Riesling, and the two wines featured here show his work with Spanish and Italian grape varieties grown in the Bonny Doon Ca’ del Solo estate vineyard. They were provided to me for review. Grahm’s love affair with the grape of Barolo has either come to an end or reached a hiatus, as far as growing it is concerned. The ‘09 vintage of Bonny Doon Nebbiolo is the last from the biodynamic Ca’ del Solo Vineyard in Monterey - at least for a while. In previous vintages, Grahm's Nebbiolo grapes were partially air-dried to concentrate ripeness. He says the finale year for the vineyard provided a warmer growing season, so air-drying was not employed. All the grapes used here are estate-grown Nebbiolo. Alcohol kicks in at 14.4% abv, and only 508 cases were made, for Bonny Doon’s DEWN wine club members. Sealed under a screwcap, it goes for $45. The wine has a medium-dark tint in the glass and smells quite brightly of red plums and blueberries. The fairly noticeable whiff of a fresh pack of Kools - my dad’s brand when I was growing up - provides an interesting angle to the bouquet. On the palate, a youthful fruit expression is up front when first poured. Then, over the course of an evening, its mood turns darker and a bit more savory. With so much going on, it’s a great wine to contemplate. It’s also a great wine to accompany a meal. The tannins are firm enough for your grandma’s meatballs, but not at all harsh. This 100% Albariño sparkler uses grapes from Jespersen Vineyard (84%) and Ca’ del Solo (16%.) It comes under a crown cap closure, requiring a churchkey like a beer or soda might. You should remove the cap very slowly, since the contents are under pressure and the bubbles like to free themselves quickly when they have the chance. Alcohol content is quite low - 12.5% abv - and only 617 cases were produced. It’s also available only to Bonny Doon’s wine club members. Randall Grahm is credited with being the original Rhone Ranger, a pioneer in making wine from the grapes of the Rhone Valley, as expressed through California terroir. His affinity for Grenache is a credit to his sensibilities, and a gift to those of us who love the variety. 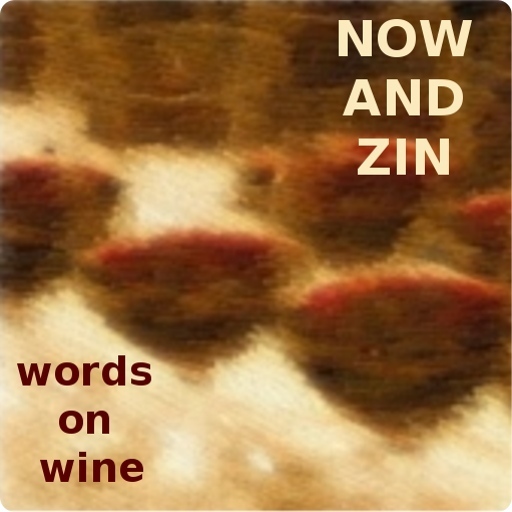 His various efforts in the field of Syrah are, arguably, unmatched in California. I don’t quote from press releases often, but in this case I will. Grahm is set to receive the Lifetime Achievement Award from the Rhone Rangers on March 22, 2013. No one in California is more deserving of that honor. These samples were provided by Bonny Doon for review. The fruit used for this wine does not come from Gilroy- the California town known as garlic capital of the world - and that results in my favorite of Grahm’s many puns: “Clos, but no Cigare.” It’s an homage to that tiny town that one can smell from the freeway. The fruit - 83% Grenache, 7% Cinsault, 6% Syrah and 4% Mourvèdre - actually comes from nine Central Coast vineyards, largely the estate vineyard in Soledad and the Alta Loma Vineyard in Greenfield. The fruit is destemmed and cold soaked to improve color and flavor. Grahm calls it a cool climate Grenache with bright fruit and a hint of black pepper. The nose is certainly bright enough, with cherry galore and a hint of tart raspberry. The savory aspect - a hallmark of Grahm's wines - comes in the form of an almost smoky mineral shading. On the palate, the cherry flavors are draped a little more heavily in that funky earthiness. A minty aspect also appears in mid palate and remains on the finish. I’m an easy touch for Bonny Doon wines anyway, but I particularly like the way this one drinks. This big, bold, 100% Syrah comes from Bien Nacido Vineyard in the Santa Maria Valley, possibly the best source for grapes in the huge Central Coast AVA. Grahm believes the Syrah clone planted in Bien Nacido’s X-Block is identical to the strain from France’s Côte Rôtie region. The cool climate of that part of the Santa Maria Valley allows full aromatic expression of that clone. Even for a cool climate site, this is a cool vintage. If Clos de Gilroy offers bright colors, this Syrah turns and runs from that. It's dark. Dark in color, dark on the nose - savory meat notes rival the trod-upon blackberry - and dark on the palate, with the standard Bonny Doon savory streak taken to an extreme. There is a rather refreshing acidity, and a hint of green - possibly a result of some whole cluster inclusion in this wine. This Liefraumilch is a German white wine made from Riesling, Müller-Thurgau, Silvaner and Kerner grapes. The designation Qualitätswein means it is a quality wine. It’s very low in alcohol - only 9.5% abv - and it is usually found on the cheap. This wine was selling at Trader Joe for only four bucks. Pale gold in color, the wine’s nose smells of sweet flowers - honeysuckle - with pears, apricots, peaches following. The palate is sweet as well, a full mouthfeel, flavors of the aforementioned fruit with a mineral undercurrent. It has a very nice acidity, especially when the sweetness is taken into account. It’s not a wine that’s going to knock anyone off their feet, but it should prove a very pleasant companion out by the pool. It should even match up nicely with a salad or a shrimp cocktail. Santorini is a Greek island of incredible beauty and rich history. Located in the Aegean Sea, about 120 miles southeast of the Greek mainland, it is the largest island in an archipelago. Santorini’s winemaking history is said to date back to 3,500 B.C. although a cataclysmic event interrupted that history. An incredible volcanic eruption around 1600 B.C. 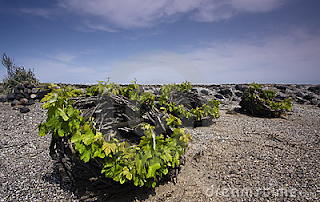 is responsible for the island’s terroir, not to mention the black sand beaches. It took over 200 years for life to begin again on Santorini after the cataclysmic event. The volcanic soil - known as aspa - has almost no organic matter, but it’s loaded with minerals, which shapes the island’s wine. The lack of clay in the soil makes the vines immune from Phylloxera, so the vines of Santorini are likely the world’s oldest ungrafted vines. The vines (above) grow in the volcanic soil and are trained in the shape of baskets, to protect them from the wind. They don’t get a lot of rain, but the rain that does fall is taken in by the porous, rocky soil and held until it’s needed in summer. Abundant fog also helps out, and the salty spray of the ocean delivers its own special salinity to the grapes. Cooling winds from the north cover the island in summer, helping the grapes to retain their naturally high acidity. There are only about half the number of vines on Santorini than there were in the 1960s, due to the the difficulty of growing them and the popularity of the island as a tourist destination - the land is more valuable when developed. The younger residents seem to be losing interest in grape growing and winemaking. Every 75 years or so, the yield of the vines becomes so low that they are cut off at the root to allow new vines to grow. It takes several years for a new vine to develop. The wines of Santorini are mainly dry, white wines which have a trademark minerality and a crisp citrus element. If you are the least bit interested in white wine, you owe it to yourself to try the wines of the island. Vinsanto - a sweet wine tinted red - is also made there. I had the opportunity to taste several wines produced on Santorini, provided for review by Wines from Santorini. The Karamolegos Winery was founded in 1952 by Artemis Karamolegos. He got the passion for winemaking from his grandfather. Although a new and modern winery was built in 2004 to employ modern winemaking technology, the traditional ways are still their guiding light. Labeled as Santorini Dry White Wine, the alcohol content is 13.5% abv. This wine is a blend of 90% Assyrtiko and 10% Aidani. the estate vineyards grow at an altitude of 150 meters, in the island’s volcanic soil. The wine is fermented in oak barrels, and is aged on the lees in barrels for two months. The retail price is $19. The wine has a golden yellow tint in the glass - it looks rich and beautiful - and there is a lovely savory note on the nose. Aromas of apricot and wet stones lead to flavors that are also mineral-based, with the taste of apricots just getting through a curtain of salinity. Citrus on the finish, along with a very nice level of acidity, makes this a great wine to pair with food. It's great with pepperoni pizza and really livens up a plain old tuna salad most excellently. Paris Sigalas started making wine at his family’s home. His winery is now a modern facility in the same village. Sigalas was a mathematician, but grapes overtook numbers in his life. It all adds up, though, because Sigalas is known for his wonderful efforts with the Assyrtiko grape. He has devoted his life to preserving the winemaking traditions of the island he calls home, and protecting the viticultural practices used there. His Assyrtiko wine carries an alcohol number of 13.5% abv, and is a blend of 75% Assyrtiko and 25% Athiri grapes, both indigenous varieties on Santorini. The aromatics of the Athiri are complementary to the mineral driven profile of Assyrtiko. The grapes are grown in the vineyards of northern Santorini, in the black lava soil. The wine is fermented in stainless steel to allow the full expression of these amazing grapes to come forward. In the glass, this wine has a yellow tint, but not quite as golden as the previous selection. The nose is simply amazing, with the expected minerals, peaches and apricots joined by aromas of salty ocean spray - the salinity is gettin' real, up in here. On the palate, the salinity stays strong, and a citrus zing makes for a tingly mouthful. In the realm of Santorini’s long winemaking tradition, SantoWines is a relative newcomer - founded in 1947. Visitors to the tasting room are treated to unmatched views of the Santorini caldera formed by the collapse of land in the destructive volcanic explosion. Santowines’ Vinsanto is made from 85% Assyrtiko and 15% Aidani grapes. The fruit is dried in the sun for eight to ten days, then fermented for two or three months before the aging process - the wine spends 36 months in oak barrels. The alcohol content is only 10.9%, and the oak effect is quite pronounced. This marvelous dessert wine has a color somewhere between brick red and whiskey brown. Its nose boasts raisins, molasses and brown sugar. That sun-dried, raisiny quality comes across on the palate, too, along with a crisp acidity and a bit of lemon zest on the finish. The mouthfeel is oily and rich. It is a recommended pairing with a traditional Greek dessert like baklava, but it also fits beautifully with cheese cake, a creamy cheese or even just a handful of nuts. We hadn't been to Vitello's Restaurant in a while, so Denise and I were taken aback by the new look at what was once a tried-and-true, old-style Italian-American eatery in the San Fernando Valley. The restaurant was sold quite a while back, and the owners apparently took their time about making changes. The changes they made to the old Rat-Packy restaurant really brought it into this century. Gone are the red leatherette banquettes. Gone are the old straw basket Chianti bottles. Also gone, unfortunately, are the old recipes. The very modern-looking redesign is nice enough. Muted green fabric has replaced the red leatherette, the tablecloths are gone, swanky music is piped in through the sound system and there's a tree in the middle of the main room decorated with tiny white Christmas lights. I suppose, since they are now used year-round nearly everywhere there is a tree in Los Angeles, that they are called "decor lights" or something like it. The trouble is, some of us are clinging to the few remaining old-line, East Coast-style Italian restaurants with a death grip. They are disappearing, these old haunts, and it's hard to see them slip away one by one. If the ghosts of Sinatra, Martin, Davis and Bishop should materialize in Los Angeles, they will now have one less place to "try the veal." I don't know whether or not the recipes at Vitello's were a part of the deal when the place sold, but even if the previous owners took the cookbook with them it should have been easy to find a new one. Miso dressing on the chopped salad tastes OK, but it should be Italian. The garlic bread doesn't look like garlic bread. It's dark toast, with a lot of stuff on it besides butter and garlic. Garlic bread isn't broken. No need to fix it. The chicken cacciatore, I don't even want to think about any more. I don't know what kind of sauce was on it, but it wasn't tomato. It seems as if the food is prepared by people who don't know what Italian-American food tastes like. It's on par with the kind of cuisine one gets at an airport. The food wasn't the end of the trouble, either. Between the salad and the entree, our server was instructed to kick us off our two-top so it could be placed with a four-top to accommodate a larger party. I don't mind moving, but I don't recall a restaurant ever asking me to do so. Our server - who apparently knew a lot more about the restaurant business than the owners - was obviously mortified. She offered us several different extras, on the house, which we politely declined. She did take 20% off the check for our trouble, however. Even so, we didn't feel that our dining dollars were very well spent. With all that, at least the wine was good. Vitello's wine list seems to be the one thing that changed for the better. There are quite a few interesting choices by the glass, and a good number of bottles from which to choose. It's a bit unusual to find a Cabernet Franc by the glass on a Los Angeles restaurant list, so I was happy to find it there. Of course, their customers who liked the old cheap Chianti and cheap Pinot Grigio may not be too happy about it. Napa Valley producer Cosentino is responsible for the Cab Franc that saved the evening for me, although it's not a Napa wine. Cosentino's 2011 Cabernet Franc carries the Lodi appellation and a 14.3% alcohol number. The grapes are 76% Cabernet Franc, 20% Cabernet Sauvignon and 4% Merlot. The wine spends 20 months in oak - French and Hungarian - a quarter of which are new barrels. The familiar Cab Franc spices and herbs grace the nose, while a beautiful green edge touches the blueberry and cherry flavors. There's a surprisingly light touch of vanilla and clove. The wood is used to really great effect in this wine. Hopefully, Vitello's can breathe some life into the food service the way they have done with the wine. Until then, for me, it's a stop which will be reserved for happy hour only.